Kenai Spine combines the expertise of fellowship-trained spine surgeons; a Mayo Clinic-trained MD who specializes in non-surgical spine care; and a team of affiliated spine therapists. 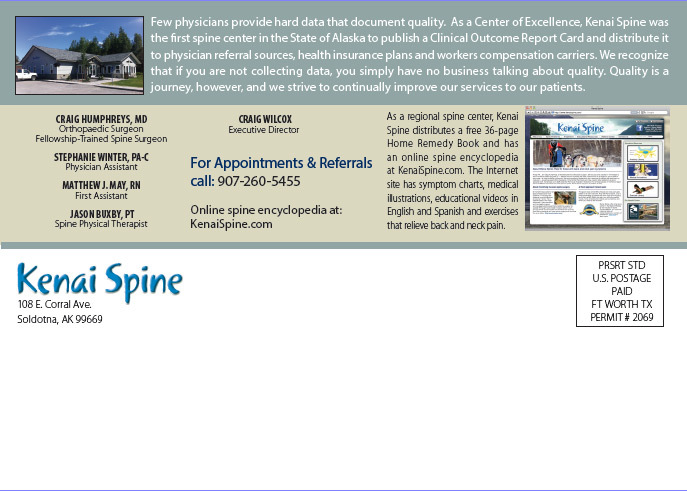 Kenai Spine has offices in Anchorage and on the Kenai Peninsula in Soldotna. The multi-disciplinary spine center includes two fellowship-trained spine surgeons — Craig Humphreys, MD and John Andreshak, MD. 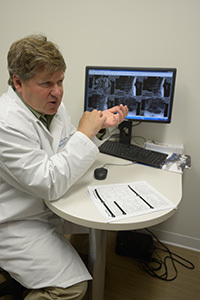 For non-surgical spine care, Kenai Spine includes the expertise of Mark Simonson, MD, a Mayo Clinic-trained spine specialist who provides non-surgical treatment options including spinal injections. 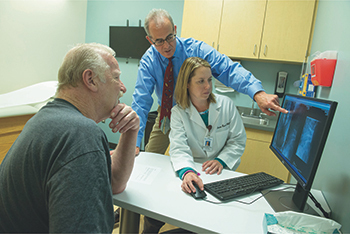 The spine center combines X-ray, MRI and spine therapists all under one roof so patients no longer have to drive around to multiple locations for diagnostics and treatment. As a statewide regional referral site for back and neck pain, the spine center receives a complex patient base from physician referral and patients who travel to the spine center from several hours away. 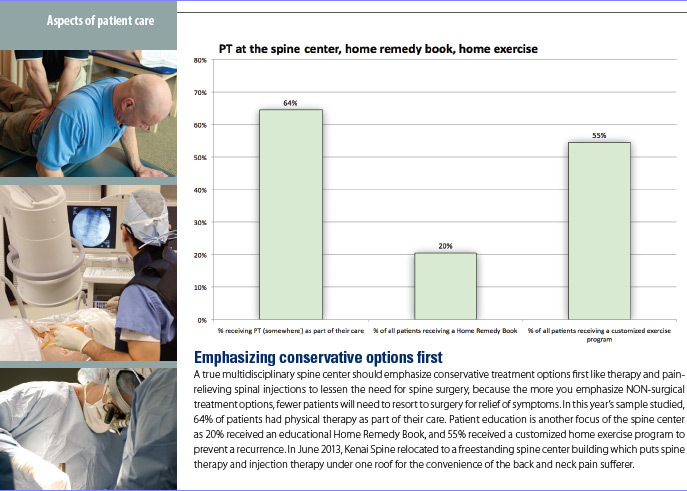 In a recent clinical outcome study, 34% of new patients coming in the front door of Kenai Spine had previous back surgery. 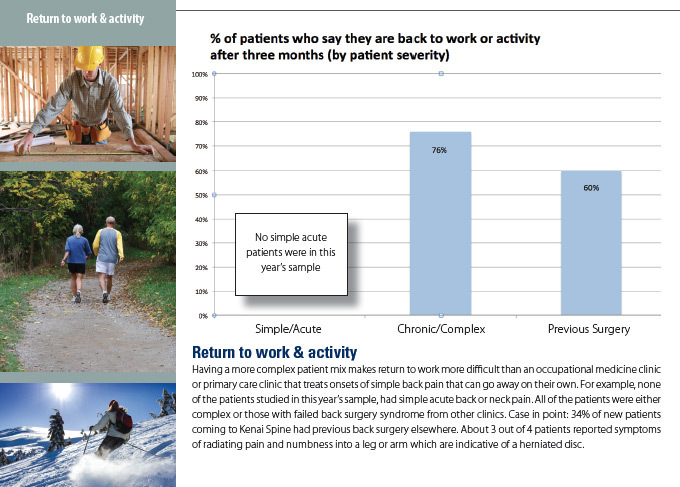 More than half of new patients had symptoms like weakness/numbness in a hand or foot, implying disc-related problems rather than simple back strain. 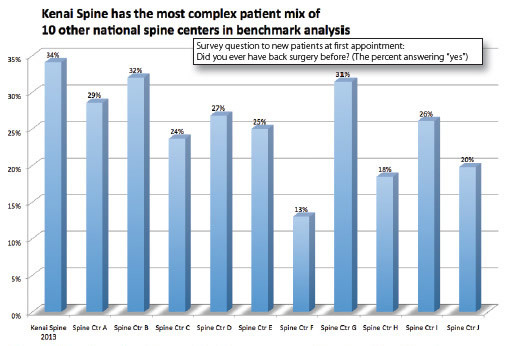 This complex patient mix represents a challenge for spine specialists. 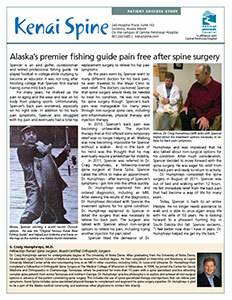 Advanced O-arm navigation: Kenai Spine’s two fellowship-trained spine surgeons — the highest level of medical training in the U.S. — have access to the most advanced O-arm surgical navigation technology available only at select numberof hospitals in the U.S.
Motion preservation through artificial disc replacement: Kenai Spine was one of the first spine centers in the State of Alaska to be trained and proficient in the use of the Mobi-C artificial disc for the cervical spine. 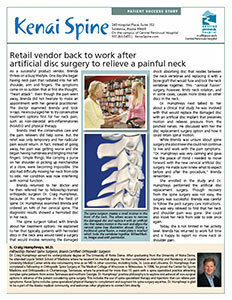 The Mobi-C artificial disc was the first FDA-approved disc for one or two levels in the neck. 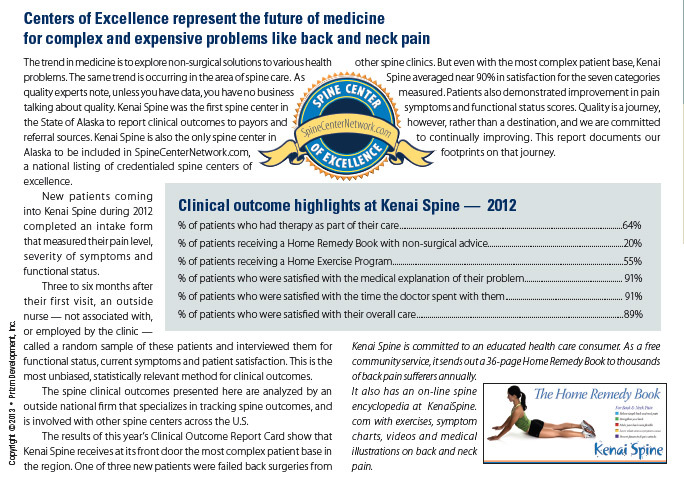 Kenai Spine was founded in 2011 by Dr. Craig Humphreys, a board-certified orthopedic surgeon who is fellowship-trained in spine, the highest level of medical training available in the United States. 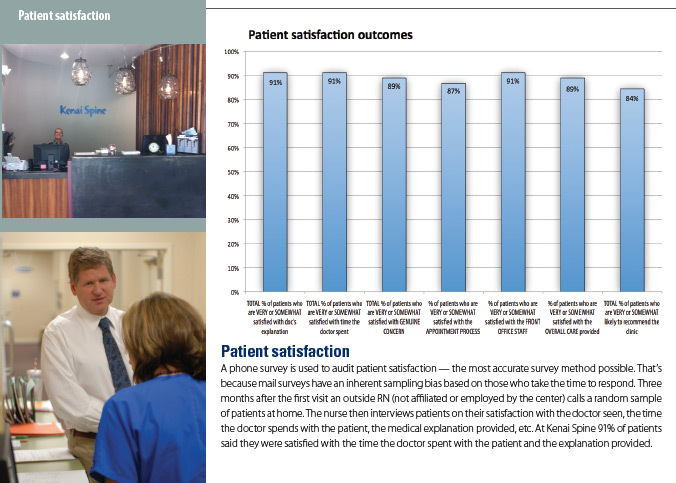 Kenai Spine believes the best healthcare starts with a well-informed consumer. 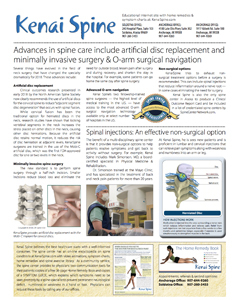 The spine center has an on-line encyclopedia on spine conditions at KenaiSpine.com with video animations, symptom charts, home remedies and spine exercise library. 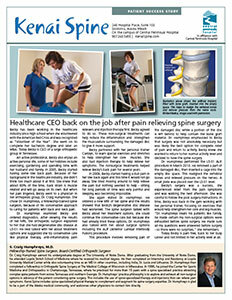 As a community service, the spine center provides to physicians two communication tools for their patients: copies of a free 36-page Home Remedy Book and copies of a SYMPTOM GUIDE, which explains which symptoms need to be seen promptly by a spine specialist to prevent permanent neurological de cit, numbness or weakness in a hand or foot. We’re pleased to announce that in May, Kenai Spine welcomes a specialist in non-surgical spine care, Mark Simonson, MD, who is board-certified in both Physical Medicine & Rehabilitation and Pain Medicine. 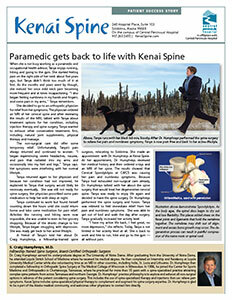 Dr. Simonson is now accepting new patient referrals related to back and neck pain at Kenai Spine in Soldotna. A physical medicine and rehabilitation (PMR) doctor specializes in the non-surgical management of back and neck pain, including the use of EMGs for diagnostic purposes and spinal injections for pain relief. Dr. Simonson received his Doctor of Medicine degree with Honors, from the University of Hawaii in 1994. 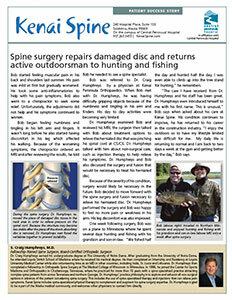 He completed his specialty training in the evaluation and nonsurgical treatment of neck and back pain in the department of Physical Medicine & Rehabilitation at the prestigious Mayo Clinic. While at the Mayo Clinic, he was named the national resident representative on the Board of Directors of the Physiatric Association of Spine, Sports & Occupational Rehabilitation (PASSOR). 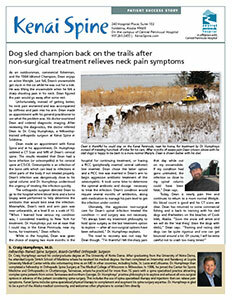 Within his role at Kenai Spine, Dr. Simonson is involved with evaluation, diagnosis and treatment of back and neck pain problems, including the use of EMGs and injection therapy. 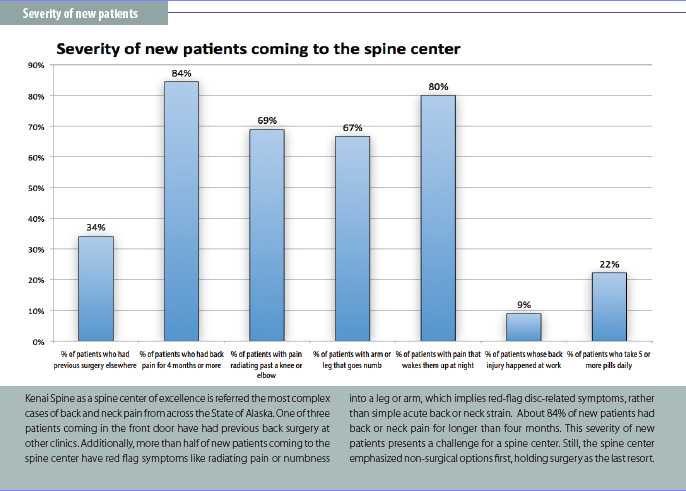 Kenai Spine is the only spine center in the State of Alaska to be included in SpineCenterNetwork.com, a national listing of spine centers that meet the credentialing criteria of having PMR, spine surgery & spine therapy, along with reporting clinical outcomes. 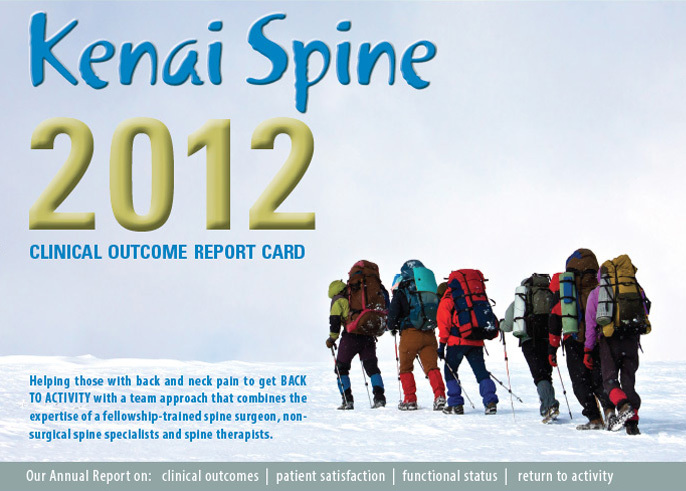 Kenai Spine was founded in 2011 to address the many complex cases of back and neck pain in the Alaska Kenai Peninsula. Unlike other national centers, the rural and tough conditions of Alaska can be back breaking. 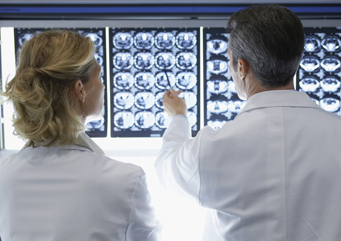 For example, more patients were men than in other spine centers. 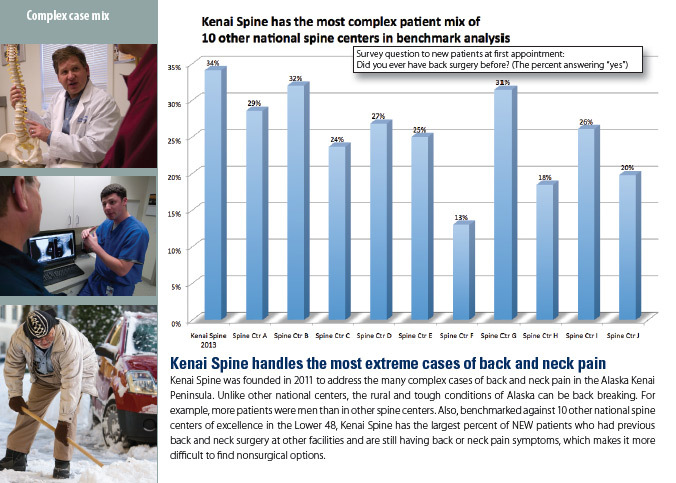 Also, benchmarked against 10 other national spine centers of excellence in the Lower 48, Kenai Spine has the largest percent of NEW patients who had previous back and neck surgery at other facilities and are still having back or neck pain symptoms, which makes it difficult to find nonsurgical options.